Posted on April 16, 2019 at 1:40 pm. When Olathe East High School students got their state-mandated CPR training this winter, freshman Seth Johnson couldn’t fully participate because of a broken collarbone. But he was paying close attention. 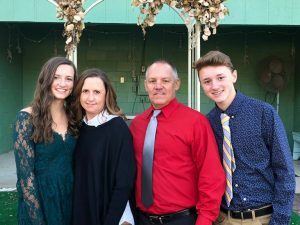 Two weeks after the training, Seth, his arm still in a sling from a lacrosse injury, helped his older sister, Claire, use CPR to save their dad when he went into cardiac arrest. Call it a hands-on follow-up lesson. Posted on April 16, 2019 at 9:48 am. – according to the results of a survey recently conducted by the American Heart Association. Posted on April 11, 2019 at 12:27 pm. When her husband experienced cardiac arrest in 2011, the dispatcher sent the ambulance the wrong way. Luckily, he was saved by a bystander who performed CPR on him under the guidance of a 911 operator. Her husband, Evan Sandstede, was lucky to have an operator who knew how to walk someone through CPR. But that’s not always the case. This legislative session, the Democratic lawmaker has proposed legislation in Minnesota that would require all 911 operators to be trained in telephone CPR. Telephone CPR is the process in which a 911 operator helps the caller identify cardiac arrest with a short script and provides “just-in-time” instructions on how to provide CPR, said Dr. Michael Kurz, chairman of the American Heart Association’s Telecommunicator-CPR Task Force. Sandstede proposed the bill after she was approached by the American Heart Association, which has been lobbying for these kinds of laws nationwide. 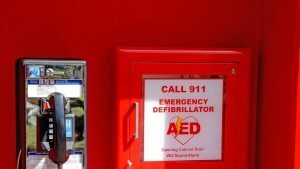 At least six states already require 911 operators to be trained in telephone CPR, according to the American Heart Association. They are Louisiana, Kentucky, Wisconsin, Indiana, West Virginia and Maryland. However, the American Heart Association has been lobbying for all states to adopt telephone CPR requirements. The organization said it would be a cost-effective way to increase the survival rates of people who experience cardiac arrest outside a hospital. Widespread implementation of telephone CPR would include three to four hours of initial training and a yearly refresher, said Kurz. “When we talk about public health interventions, this is a relatively low-cost, very high-yield way to improve public health,” he said. Sandstede said her bill is modeled after Wisconsin’s law, which was enacted in 2018 and set aside $250,000 for telephone CPR training. About 350,000 sudden cardiac-arrest events occur in the United States each year, and survival rates nationwide average about 10%, Kurz said. 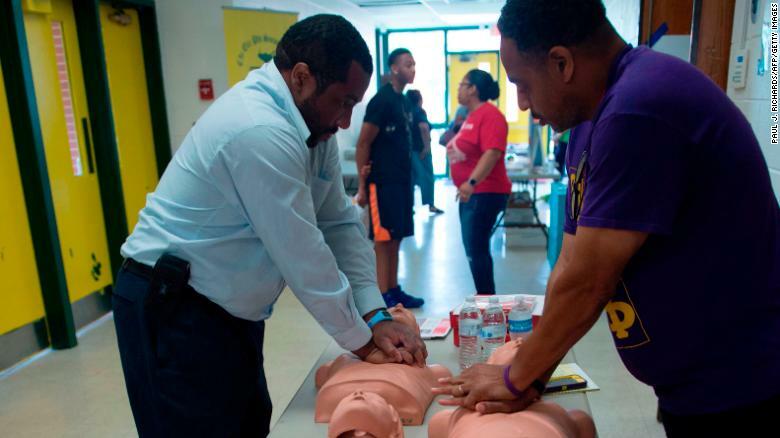 A 2018 Cleveland Clinic survey found that 54% of Americans say they know how to perform CPR. However, only 11% of respondents knew the correct pace for performing the chest compressions, the survey found. Having a bystander provide CPR before paramedics arrive on the scene can double or even triple the rate of survival, Kurz said. 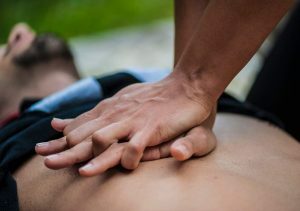 Telephone CPR-trained 911 operators can identify whether someone is going into cardiac arrest with two questions, and can provide CPR instructions in about 20 seconds. Some people think that telephone CPR is equivalent to practicing medicine and only physicians who are licensed should do that. However, Kurz said that is a misconception that is hindering public health. Posted on April 11, 2019 at 9:54 am. It was a normal day.. They ran back as fast as they could. The next thing Winness knew, he was grabbing the Automated External Defibrillator (AED) inside the building while Smidt ran to Clark’s aid. Winness was by Clark’s side instantly after grabbing the AED. Winness doesn’t remember panicking, just taking the steps he needed to save his best friend’s life. “I guess you just do whatever you have to do, you know? You don’t really think about it,” Winness said. The first step in using the AED was to apply adhesive strips to Clark’s chest for the AED to read what should be done. Since Clark had a pacemaker, the AED just instructed Winness to give CPR. He started chest compressions while another bystander stood on the line with a 9-1-1 dispatcher. What Winness did helped provide the necessary oxygen to Clark’s brain and helped his heart pump blood while they waited for emergency responders. It was only minutes, but what he did was vital to preserving Clark’s well-being, according to Scott Christensen, director of clinical service for Patient Care EMS. If Winness wasn’t there to give CPR before units arrived, Christensen speculated that Clark might have passed away. Clark, 81, was released from the heart hospital Friday. He’s in relatively good condition and was advised by his doctor to “lay low” for a few weeks. This was Clark’s second heart attack, and he’s been suffering episodes for half his life. Winness and Clark talked about what they would do if this happened. They were prepared as much as they could be. Such training, for AED or CPR, saves lives, according to Christensen. And it’s worthwhile for anyone to learn the life-saving techniques, even hands-only CPR. It’s common for bystanders to take action in Sioux Falls, just as Bill took charge to help Clark. Nationally though, the REMSA registry’s average is action from bystanders in 38 percent of cardiac arrests. Part of that is because of wide CPR training in the Sioux Falls area and because of dispatchers instructing 9-1-1 callers how to give CPR. 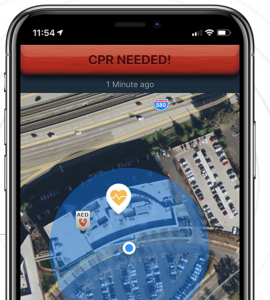 The high rate of bystander help can also be attributed to Sioux Falls Fire Rescue’s Pulsepoint app, which alerts people when CPR is needed nearby. “Any CPR is better than no CPR,” Christensen said. For AEDs, it’s 28 percent of bystanders who intervene with the device in Sioux Falls. About 11 percent of bystanders across the registry intervened with an AED in 2017. There isn’t a standard on how to provide signs for AEDs, Christensen said. Clark worries there needs to be better ways to inform people where the AEDs are — it could mean life or death. Posted on April 8, 2019 at 1:19 pm. Gibson Gaynesbloom, 63, went into cardiac arrest March 5 while working at a Little Caesars in New Philadelphia, the television station reported. His co-workers sprang into action. Keralyn Songer, 34, called paramedics. Nicole Strong, 35, who told WJW she learned CPR in high school, cleared Gaynesbloom’s air passage and put him on his back. Brody Ferris, who learned CPR last summer — “I only had three lifeguarding classes at the YMCA,” he told WJW — also helped out. Strong continued mouth-to-mouth resuscitation until paramedics arrived, the television station reported. Andrea Tyson, who owns the pizza shop, threw a party for the trio Friday and gave them gift cards, WJW reported. “The conversation I had with the three of them was that I believe that if one of them was not trained in CPR, then I don’t think he would be here today. I know he wouldn’t be here,” Tyson told the television station. Posted on February 22, 2019 at 4:27 pm. 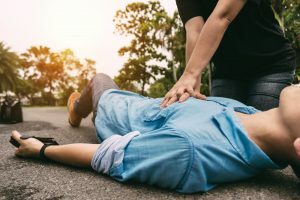 The life saving skill you should know – CPR, are you ready to save a life? Posted on February 8, 2019 at 10:13 am. Posted on February 4, 2019 at 3:56 pm. 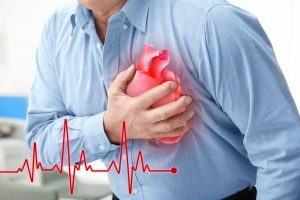 Signs of a heart attack, you need to read this…..
Posted on January 31, 2019 at 5:45 pm. Posted on December 10, 2018 at 2:34 pm. Often times sudden cardiac arrest and heart attack are used synonymously. In truth, the two are very different from one another. Sudden cardiac arrest is when the heart malfunctions and suddenly stops beating. A heart attack is when blood flow to the heart is blocked. 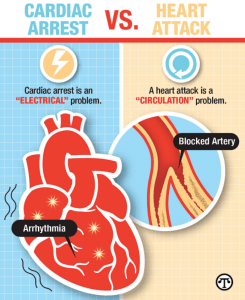 In short, a heart attack is about “circulation” and sudden cardiac arrest is an “electrical” problem. A heart attack occurs when a blocked artery prevents oxygen-rich blood from reaching a section of the heart. If the blocked artery is not reopened quickly, the part of the heart normally nourished begins to die. The longer a person goes without receiving treatment, greater damage will be done to the heart. Symptoms can occur almost immediately. Materializing as a sharp pain in the chest, and may travel to the arm, shoulder and back. The symptoms may occur slowly over days or weeks prior to a heart attack. These symptoms often appear as shortness of breath or heartburn. Unlike with sudden cardiac arrest, the heart usually doesn’t stop beating during a heart attack. Sudden cardiac arrest occurs suddenly and very often without warning. It is when the heart abruptly begins to beat in an abnormal or irregular rhythm called (arrhythmia). Without organized electrical activity in the heart muscle, there is no consistent contraction of the ventricles, which results in the heart’s inability to generate an adequate cardiac output. With its pumping action disrupted, the heart cannot pump blood to the brain, lungs and other organs. Within seconds a person will lose consciousness and have no pulse. Death can occur within minutes if the victim does not receive immediate treatment. 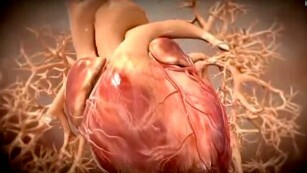 Heart attacks do increase the risk for sudden cardiac arrest. 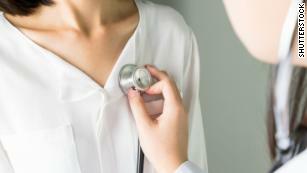 Other heart conditions can also increase the likelihood for sudden cardiac arrest as well. These conditions include a thickened heart cardiomyopathy, heart failure, arrhythmias, particularly ventricular fibrillation, and long Q-T syndrome. A cardiac arrest victim can be saved if treated immediately. First, **call 9-1-1 for emergency medical services. Then get a Defibrillator (AED) automated external defibrillator if one is available and use it as soon as it arrives. Begin CPR immediately and continue until professional emergency medical personnel arrive. If two people are available, one should begin CPR immediately while the other calls 9-1-1 and finds the Defibrillator. There are over 320,000 out-of-hospital cardiac arrests occur annually in the United States. By performing Hands-Only CPR, you can double or even triple a victim’s chance of survival.